The true meaning of HMA is Heavy Metal Axe, and these filters will always contain a heavy metal removal cartridge. However, there is only one true lead and heavy metal removal cartridge available in 10″ format, which is the CBR2-10. This cartridge only has a life of 7,200 litres for lead removal. 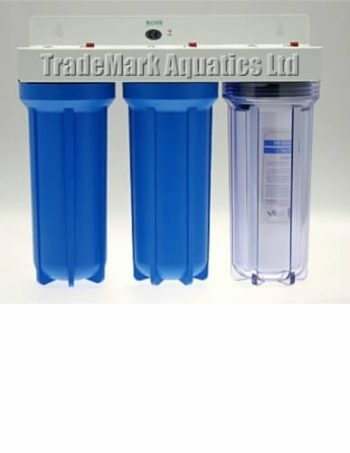 If your water does not contain heavy metals such as lead and copper, you would be better off purchasing a professional dechlorinator, and the cartridges in these have a life expectancy of over 70,000 litres. We specialise in bespoke HMA and dechlorination units and can provide systems ranging from 3.6 litres per minute to light commercial units providing 15+ litres per minute. We can supply your new system with flow and total volume meters to ensure you get the best out of your unit. We can build units to fit most existing pipework and can build left-to-right or right-to-left flows. We have a very fast turnaround on our bespoke systems and can usually provide a complete system built to your requirements within two days. Prices for our true HMA units start at around £120; dechlorinators start at around £45. We carry a full range of plumbing fittings to facilitate easy connection to your water supply. We also stock a full range of RO spares, HMA filters and accessories, but if you can’t find what you are looking for or need some help please do contact us for advice.